Explanation: Rising as the Sun sets, tonight's Full Moon could be hard to miss. Remarkably, its exact full phase (May 6 03:36 UT) will occur less than two minutes after it reaches perigee, the closest point to Earth in the Moon's orbit, making it the largest Full Moon of 2012. The Full Perigee Moon will appear to be some 14 percent larger and 30 percent brighter than a Full Moon near apogee, the most distant point in the elliptical lunar orbit. 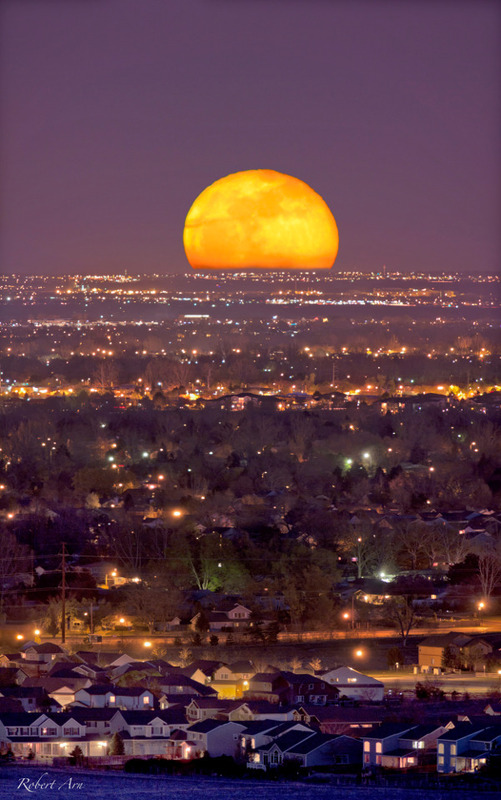 In comparison, though, it will appear less than 1 percent larger and almost as bright as April's Full Moon, captured in this telephoto image rising over suburban Fort Collins, Colorado, USA. For that lunation, Full Moon and perigee were about 21 hours apart. Of course, if you manage to miss May's Full Perigee Moon, make a note on your calendar. Your next chance to see a Full Moon close to perigee, will be next year on June 23.